Paraguayan regulations on police use of force and firearms generally accord with international standards. The right to life is inherent to the human person. Its protection is guaranteed, in general, from conception. The death penalty is hereby abolished. All persons will be protected by the State in their physical and psychological integrity, as well as in their honor and their reputation. The law will regulate the freedom of persons to dispose of their own body, only for scientific or medical ends. Article 5 specifies that: "No one will be submitted to torture or to cruel, inhuman, or degrading penalties or treatment." Persons have the right to meet and to demonstrate peacefully, without weapons and with licit ends, without the need of a permit, as well as the right not to be obligated to participate in such acts. The law may only regulate its exercise in places of public traffic, [and] at certain hours, preserving the rights of third parties and the public order established by the law. The National Police is a professional, non-deliberative, obedient institution, organized with permanent character and in hierarchic dependence to the organ of the Executive Power entrusted with the internal security of the Nation. The National Police of Paraguay is the primary law enforcement agency in Paraguay, operating under the auspices of the Ministry of Internal Affairs. National Police Organization Act No. 222/93 does not specifically regulate the use of force by the police, although Article 3 stipulates that the police will exercises its duties in accordance with constitutional and legal norms, and will base its action on respect for human rights. Act No. 1337/99 on National Defence and Internal Security provides for the deployment of the amed forces in dealing with internal security matters. can and should use the necessary force to fulfill their mandate. 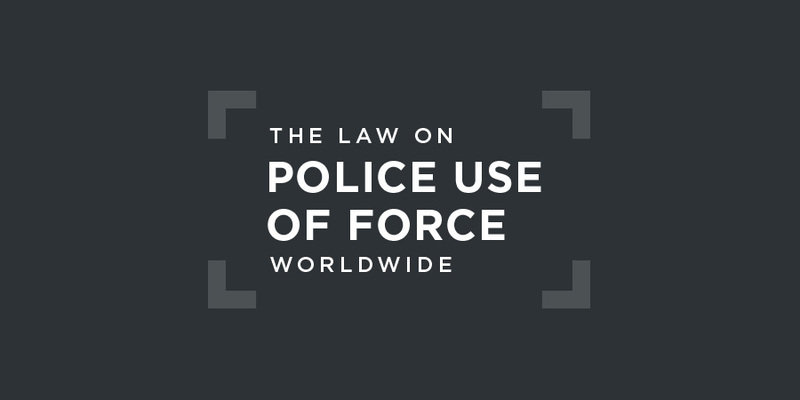 However, excessive or inappropriate use of force may mean administrative, civil and/or criminal liability. Therefore, force should be used only when strictly necessary. The use of a chemical agent, such as gas or pepper spray, may become necessary when police personnel reasonably believe that other force options would be inappropriate or ineffective to control alleged resistant or combative offenders, as well as to reduce the chances of physical injuries of the individuals involved. Tear gas or pepper spray should not be used against alleged perpetrators who demonstrate peacefully. In these cases, it can only be used when authorized as part of a crowd control strategy. Police personnel may be forced to use lethal force to protect themselves or others when they reasonably believe, based on the facts and circumstances given, that there is an imminent threat of death or severe physical injury. Police personnel may use lethal force to carry out an arrest or to prevent the flight of an alleged perpetrator, provided there is a high probability that the alleged perpetrator poses a significant and immediate threat of death or severe physical injury to the police or others, unless it is stopped without delay. There is no dedicated independent civilian police oversight body but the Defensoria del Pueblo (Office of the Ombudsman) is an independent institution for the defence of human rights that may investigate allegations of unlawful police use of force. about information in the report of the national preventive mechanism indicating that numerous human rights violations, including acts of torture, have been committed in the country’s northern departments by the military-police unit known as the Joint Task Force. This case concerned an agricultural worker, Blanco Dominguez, who took part in a peaceful demonstration in Paraguay in favour of agrarian reform. The demonstrators came face to face with a police barrier and decided to blockade the road. The prosecutor ordered the leaders of the demonstration to unblock the road, and told them that if they failed to do so it would be cleared by force. While negotiations were underway, the prosecutor ordered the road to be cleared. The police attack was immediate and violent, and involved use of tear gas, firearms, and water cannon. The police beat many demonstrators, fired indiscriminately at those who were fleeing, and violently broke into and damaged various nearby houses, beating severely any persons they managed to catch. Both metal-jacketed and rubber bullets were used indiscriminately. Mr Dominguez had been at the head of the demonstration and, along with other demonstrators, had peacefully surrendered to the police, kneeling down with his hands up. While he was in this position, an officer of the National Police shot him in the back at very close range. After he fell to the ground, he was hit on the head by the police. After two operations, Blanco Dominguez died on 5 June 2003. In finding a violation of the right to life, the Human Rights Committee reiterated Paraguay’s obligation to protect the life of the demonstrators. In December 2017, the Inter-American Commission on Human Rights (IACHR) announced it had filed an application with the Inter-American Court of Human Rights in Case 12.685, Juan Francisco Arrom Suhurt, Anuncio Martí Méndez, and Families, with regard to Paraguay. The case concerns the forced disappearance and torture of Juan Francisco Arrom Suhurt and Anuncio Martí Méndez, leaders of the Patria Libre political movement, from 17 to 30 January 2002. Both men reported that they were arrested by State agents who interrogated them constantly about their political activities and pressured them so that they would plead guilty to the kidnapping of María Edith Bordón de Debernardi, who had been abducted days before and for whose release a large sum of money was being demanded. The petitioners recounted that their family members set out to look for them until they discovered their whereabouts. On December 1, 2003, both men obtained refugee status in Brazil. Furthermore, in the judicial case to investigate the kidnapping of María Edith Bordón, both men were declared to be in contempt of court because of their failure to appear. The Commission concluded that the State of Paraguay is responsible for violating human rights protected in the American Convention on Human Rights, the Inter-American Convention on Forced Disappearance of Persons, and the Inter-American Convention to Prevent and Punish Torture. The Paraguayan authorities did not act with due diligence either when they learned of the possible disappearance of Juan Francisco Arrom Suhurt and Anuncio Martí Méndez or during the investigation. They failed to proactively open an investigation, and they violated the principle of the victims’ presumption of innocence by issuing official propaganda that described them as responsible for a kidnapping without a final conviction. Moreover, there are multiple elements that point to the direct participation of State agents, elements that were not diligently investigated. The IACHR found this participation to be established fact. In its Merits Report on the case, the Commission recommended to Paraguay that it provide full redress for the human rights violations, adopting measures for economic compensation and satisfaction, and that it arrange for physical and mental health rehabilitation measures for Juan Arrom and Anuncio Martí if they so wished and in agreement with them. Considering that they are in Brazil, it is incumbent to pay a specific amount to cover their medical services in that country. Paraguay should also reopen and complete the criminal investigation diligently, effectively, and within a reasonable time frame to fully clarify the facts, identify all those potentially responsible, and impose the appropriate penalties in regard to the human rights violations laid out in the report. In terms of non-repetition mechanisms, the Commission recommended strengthening the investigative capacity of the Public Prosecutor’s Office, especially for cases involving serious human rights violations, to ensure that investigations are opened proactively and carried out with due diligence. It also recommended that any actions of the Public Prosecutor’s Office that could definitively eliminate the possibility of investigating serious human rights violations be subject to judicial control, and that the necessary measures be adopted to ensure that in the course of investigations and criminal cases, all authorities fulfill their obligation to respect the presumption of innocence and refrain from stigmatizing those being prosecuted in the context of searching for them. The Inter-American Commission submitted the case to the Inter-American Court’s jurisdiction on December 12, 2017, because it deemed that Paraguay had not complied with the recommendations contained in the Merits Report. The case, the Commission believes, will enable the Inter-American Court to expand case law in cases involving forced disappearance of persons and torture. While such violations have been addressed extensively in the case law of the Commission and the Court, this case did not take place in the context of a dictatorship or armed conflict with systematic human rights violations; this means that the Court will be able to expand on the applicable evidentiary standards, and especially the concrete implications of the lack of a serious and diligent investigation into indications of State participation. In addition, the case will allow the Court to expand its case law in relation to the principle of presumption of innocence in circumstances in which different State agents have made public statements about the criminal responsibility of someone who has not been convicted by means of a final decision.